Next week, thousands of visitors will converge in Pensacola for this year’s SkillsUSA State Leadership and Skills Conference at the Pensacola Bay Center. Pensacola State College won the bid to host the SkillsUSA Florida State Leadership & Skills Conference and Worlds of Possibilities Career Expo this year through 2020, thanks to the efforts of a team of businesspeople who recognized the benefits to our community. In July 2015, Stan Connally, Gulf Power chairman, president & CEO, worked with PSC President Edward Meadows to form an executive committee of community supporters to begin the process of bringing the Skills State Conference back to Pensacola. 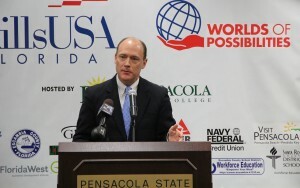 Gulf Power president and CEO, Stan Connally, helps to announce the return of the SkillsUSA Florida Leadership and Skills conference to Pensacola State College during a press conference in February 2016. SkillsUSA and its multi-million dollar economic impact have committed to return to the area for three years beginning in 2018. Connally said the state conference will have a “reputational impact” on Pensacola. “We’re showing the rest of the state, and the rest of the country, that this is a community that gets it when it comes to career and technical education,” he said. SkillsUSA, the largest student organization in the country, serves as a partnership between students, teachers and industry to ensure the United States has a skilled workforce. PSC previously hosted the SkillsUSA State Conference and Worlds of Possibilities Career Expo from 2012 through 2014, drawing record numbers of attendees from across the state. The cumulative economic impact of the three state conferences could be more than $10 million to the local community. Attendance is expected to be 6,000 at this year’s April 29-May 1 conference, competition, Worlds of Possibilities and job fair, creating an economic impact of $3.8 million. Gulf Power is once again joining dozens of sponsors in presenting the eighth annual SkillsUSA Worlds of Possibilities Career Expo, April 30-May 1, at the Pensacola Bay Center, and is hosting the expo’s World of Energy. 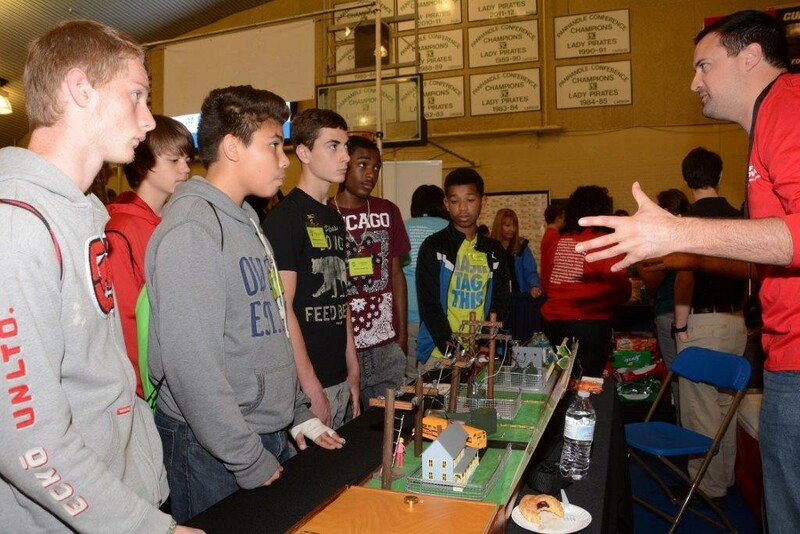 Middle and high school students from Escambia and Santa Rosa counties participate in hands-on activities to learn about careers in the energy industry, including jobs at Gulf Power. Worlds of Possibilities will showcase 60 business and industry partners from across the state in technical career fields such as energy, manufacturing, information technology, safety, finance, education, construction and aviation with hands-on interactive experiences to engage thousands of students of all ages from Escambia and Santa Rosa counties. In addition to Connally and Meadows, executive committee members who worked to secure the upcoming SkillsUSA State Conferences were Sandy Sansing of Sandy Sansing Dealerships; Debbie Calder, Navy Federal Credit Union; Richard McLeod, Lowe’s Home Improvement; Michael Murdoch, AppRiver; Brian Masterson, Jerry Pate Co.; Mark Faulkner, Baptist Health Care; and Randy Ramos, Global Business Solutions.